What’s one way to keep the momentum going in 2015?! When we start to wane a little in regards to our resolutions and our energy levels dip; what options are there?! I know there will be mornings when I get up and don’t feel I have the energy to do what I said I’d do. But if I’m to succeed (my first half marathon is in 7 weeks) I will need to put in the training even on those days I don’t feel like it. One option is a ginseng supplement. Ginseng is believed to help you sustain energy levels as well as strengthening the body against physical and mental stress. Some people have even found it to help them increase concentration and alertness! Simply Supplements have kindly sponsored a giveaway so you can try them yourselves! You can enter NOW via the rafflecopter plug-in below! Entries close on 19th January 2015 and are open to all those in the United Kingdom. 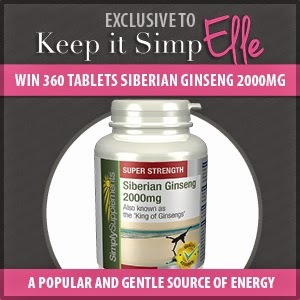 You can also get yourself 15% off Korean & Siberian Ginseng at Simply Supplements exclusive to ‘keep it simpElle“. Use code ENGY15 valid all the way through January 2015! What are your favourite supplements for energy?! Previous Post Want more energy for the New Year?! Next Post The “REAL” Cost of Getting Fit! couldn't agree more! good luck for the competition! plenty of water and sleep! couldn't agree more! …water is one I could do better on each day! good luck for the competition! yes 🙂 love a good Yin class….or a Rocket class! different ends of the spectrum! haha! good luck for the competition! hahaha! good luck for the competition! A juice of fresh fruit & vegetables, freshly made always gives me a boost!! Yum! I've been a fan of juicing since I finally got my hands on my own juicer! good luck for the competition! Can't go wrong with that! good luck for the competition! Want more energy for the New Year? !